Capt. Tommy Thompson is a licensed USCG boat captain and outdoor writer. He was previously executive director of the Florida Outdoor Writers Association and as an outdoor journalist specializing in saltwater fishing, he frequently contributes to such magazines as Florida Sportsman and Shallow Water Angler. 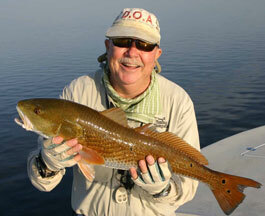 He currently writes the monthly Big Bend Action Spotter column and is the food columnist for Florida Sportsman magazine. His books, The Saltwater Angler’s Guide to Florida’s Big Bend and Emerald Coast and The Saltwater Angler’s Guide to Tampa Bay and Southwest Florida were published by the University Press of Florida. If it’s about food in our region, Tommy Thompson likely either knows about it–or has eaten it. Expect to hear about local delicacies, from Cedar Key clams to Steinhatchee stone crabs to Cross Creek frog legs to wine from regional vineyards. And it’s not just about the raw ingredients, but the places that serve them. And there’s no guarantee you’ll be able to stay on your diet! Tommy also writes our family events posts and “Off the Beaten Path” itineraries. He believes that lots of places in Natural North Florida are historical–and many are just plain hysterical! Whether it’s music festivals, seafood tastings, seasonal celebrations or just plain “having fun” at our springs and rivers that interests you, look for his posts in our travel blogs.